Published Jan 4, 2019 by Pearson IT Certification. Part of the LiveLessons series. The Premium Edition Video is a digital-only certification preparation product combining a video course with enhanced Pearson IT Certification Practice Tests. More than 14 hours of video instruction prepare the viewer for the AWS Associate Level Certified Developer exam by discussing and demonstrating the services included in the published blueprint of the exam, including AWS CLI & SDK, IAM, VPC, EC2, Route53 DNS, S3, DynamoDB, and more. AWS Certified Developer Complete Video Course focuses on the role-based certification, AWS Developer Associate. According to Amazon, “this exam validates proficiency in developing, deploying, and debugging cloud-based applications using AWS.” Amazon Web Services currently has more than 130 individual services available for use. Each service falls into an overarching category such as compute, storage, database, networking, and so on. The AWS Developer Associate focuses on those services and concepts relevant to developers using, or intending to use, AWS services to create their applications. 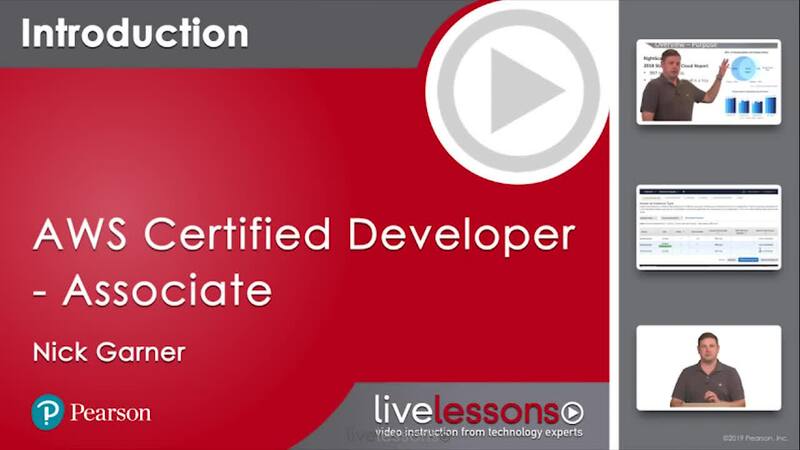 This course covers the published blueprint for the Associate Level Certified Developer exam. This course is not intended to teach you to how program or develop applications. The goal is to help you understand the services available to run the applications you develop through live demonstration. Each lesson begins with a walk-through to provide an overview of the topic and then goes into demonstration mode. Most of the demonstrations in this course are accomplished with a free AWS Trial Account so you can follow along. This course takes a lab-based approach to teaching, which means we will focus on how to develop throughout the training so you can get some hands-on experience working in AWS. You will also learn about the objectives in the exam, but the emphasis is on doing so you can gain the experience needed to develop in AWS as well as pass the test. Each lesson has a lab-based exercise that walks you through concepts and allows you to dive into a project. Lab files are included as downloads with the course so you can work alongside the author and work on projects. Nick Garner has co-founded an IoT company that runs entirely on AWS infrastructure that he manages. He has certifications in AWS, CEH, CISSP, and two CCIEs (routing/switching and security). He works with Amazon Web Services design daily, particularly with respect to extending enterprise services into cloud service providers such as Amazon AWS, Microsoft Azure, and Google Compute. Understand the services that are available to run the applications your team is developing. Amazon recommends one or more years of hands-on experience in developing and maintaining applications on AWS services, and in-depth knowledge of at least one high-level programming language, such as Java or Python. Lesson 1 lays out the purpose and areas of focus of this course, as well as setting expectations and expected outcomes. Lesson 2 answers the question “Why should we move our applications to the cloud? Wouldn’t it be easier to just run them in-house?” A general overview of Amazon Web Services and some of the services are provided. Lesson 3 provides a walk-through of setting up a lab so you can follow along with the demonstrations. In Lesson 4, scripting and automation with the CLI are discussed, as well as the AWS software development kit. The SDK allows you to interact with AWS services using one of several popular programming languages, such as Node.js or Python. Lesson 5 discusses security, including security at a services authentication level. The IAM service provides the means to create user accounts that can be used for either interactive or programmatic access to AWS services. Lesson 6 discusses how VPCs are created, and how networking and security are applied. Lesson 7 discusses what EC2 is, where the operating systems of those instances come from, and how to get access to your servers. Lesson 8 demonstrates Route53, which is a managed domain name system service offered by AWS. The lesson shows how it distinguishes itself through its ability to offer query responses based on the state of other AWS services, as well as its ease of use. Lesson 9 covers one of the most popular services. S3. From generic file storage to offering static website content, S3 is a one-stop shop for storing files, which will be demonstrated here. In Lesson 10, the relational database service from AWS is covered. The RDS service offers a managed database service where you access an instance of your chosen database software, running on an operating system on a server, both managed by Amazon. Lesson 11 demonstrates this fully managed service, and shows how it allows for synchronous replication across multiple regions. Lesson 12 demonstrates SQS, the distributed message queueing service. It is a managed service you can interact with programmatically to store messages for later processing. Lesson 13 demonstrates AWS SNS, which is a notification service for sending messages. AWS SNS follows the publisher subscriber, or provider consumer, methodology and can deliver messages through mobile push notifications, email, and SMS. Lesson 14 discusses what Lambda is and how to use it. AWS Lambda is all about serverless code execution. If you think back to your computer science classes where you learned about lambda abstraction or anonymous functions that take a single input, this is kind of like that but, of course, these functions are not anonymous. Lesson 15 demonstrates AWS Elastic Beanstalk, which is an orchestration service. It provides a layer of abstraction between the underlying OS/server and your application. For example, if you have a web application written in PHP, elastic beanstalk can be used to run your code, automatically provisioning the underlying EC2 instance, security settings, load balancers, and auto-scaling. Lesson 16 demonstrates ingestion of real-time data for instant processing and analysis. Lesson 17 discusses this fully managed service, which allows you to create secure APIs that scale. API Gateway acts as an entry point to your applications running across various AWS services such as Lambda, EC2, or even files in S3. Lesson 18 looks at the CloudFormation components and walks through using CloudFormation to provision and update your infrastructure. Lesson 19 covers several AWS services that are targeted at developers and managing code. For example, CodeCommit is a managed git repository, CodeBuild can be used to build and test your code, and CodeDeploy can be used for continuous integration. Lesson 20 reviews Amazon’s published shared responsibility model, and outlines what Amazon is responsible for and what you are responsible for. Video Lessons are available for download for offline viewing within the streaming format. Look for the green arrow in each lesson.